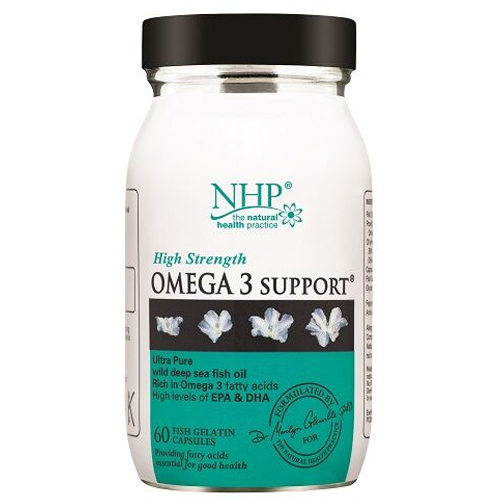 Natural Health Practice - High Strength Omega 3 Support is an ultra pure, wild deep sea fish oil. It is rich in omega 3 fatty acids and contains high levels of EPA and DHA. Essential fats are a vital component of every human cell, they `oil` the body by lubricating the joints and skin. High Strength Omega 3 Support contains 770mg of EPA and 510mg DHA per two capsules. It comes in the form of fish gelatine capsules, unlike standard bovine capsules. These capsules come from small fish such as anchovies and sardines, not tuna (which carry high levels of heavy metals such as mercury). Each batch is screened for contaminants e.g. dioxins, PCBs, mercury, lead, arsenic and cadmium. Omega 3 Support fish oil is derived from the body of the fish not the liver, which can be the most polluted and contaminated part of the fish. The fish oil in Omega 3 Support in its natural triglyceride form for optimum absorption, unlike many high street fish oils which are in the ester or phospholipid form. It also contains vitamin E which has antioxidant properties to prevent it going rancid. Omega 3 Support is free from gluten, yeast and dairy products. It is made without the use of artificial flavours, colours or preservatives and is Kosher. Your body needs essential fats to balance hormones, insulate nerve cells, keep the skin and arteries supple and also to keep the body warm. Your body cannot manufacture omega 3 essential fatty acids - that is why they are called ‘essential’ because they have to come from your diet or from supplements. Both EPA and DHA contained Omega 3 Support contribute to the normal function of the heart and they also contribute to the maintenance of normal blood pressure. DHA also contributes to maintenance of normal brain function. With Omega 3 Support there is no fishy after-taste, they are easy to swallow, and they are safe for pregnancy and breastfeeding. DHA in particular is important for pregnant women especially in the last trimester, as DHA is needed for healthy brain growth and development of the baby during pregnancy. The UK Department of Health recommends that we should all double our intake of omega 3s by eating oily fish (such as salmon) two to three times a week. Fish Oil, Peppermint Oil, Antioxidant: Natural Mixed Tocopherols, Capsule Shell: Fish Gelatin, Glycerol. For best results take one capsule twice, daily with food. Below are reviews of Natural Health Practice Omega 3 Support - 60 Capsules by bodykind customers. If you have tried this product we'd love to hear what you think so please leave a review. 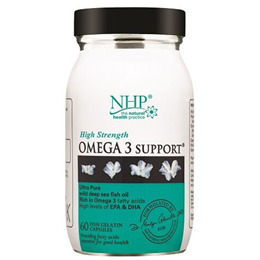 Natural Health Practice - High Strength Omega 3 Support is an ultra pure, wild deep sea fish oil. It is rich in omega 3 fatty acids and contains high levels of EPA and DHA. Essential fats are a vital component of every human cell.